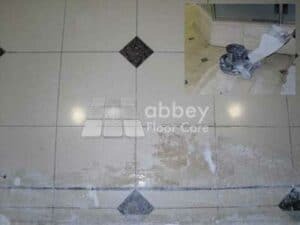 Honing is used to remove scratches, marks and light damage from a marble or stone floor by removing a small amount of stone off the surface of the marble. Revealing a fresh new surface ready for final finishing, e.g. 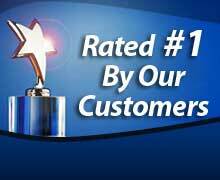 polishing or sealing. 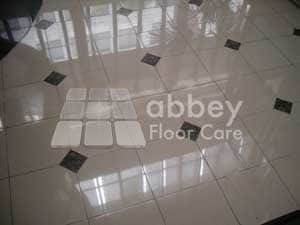 Previously this marble floor has been covered with carpet tiles to hide scratches and marks in the surface. Once the carpet had been removed, we used honing tools to remove the old adhesive, scratches and small marks. Thankfully the floor was not badly scratched, so we did not have to grind the floor before we started honing. The inset image shows the honing process in operation. The process creates a light slurry as the microns of the surface of the marble are gradually removed. Honing is also used after grinding to gradually close the stone and make it ready for further finishing. A honed surface can range from a dull non reflective finish to a high sheen. The floor in the image above was honed to quite a high sheen in preparation for final polishing. The hazy reflection of the light bulbs demonstrates the level of honing. The final specification was for a high polish. This image of the final finish show how honing is not designed to take a lot off the marble. You can see the ripples in the reflection showing how the honing process follows the contours in the floor and does not make it flat. If the floor had been ground, it would have been flat and there reflections would not ripple.